Torban [торбан]. A musical string instrument that is plucked. 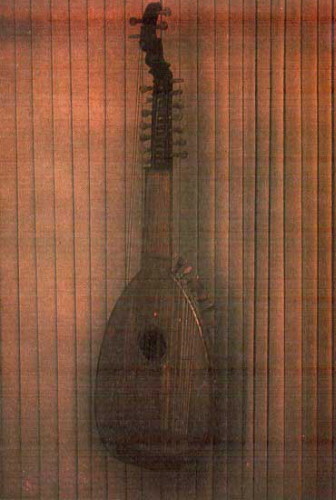 The Ukrainian torban is closely related to the shorter-necked Paduan theorbo as described by M. Praetorius (Syntagma musicum, 1618), but differs from the Western European instrument in that it has three sets of courses instead of two. In addition to the diapason and stopped strings, the torban has high-pitched prystrunky (accompaniment strings) which run along the deck of the instrument. In total the torban has 25 to 60 strings. During the 17th century the torban was the instrument of the Ukrainian nobility. It spread into Poland and Russia but remained in use until the end of the 19th century only in Ukraine. Well-known torbanists included I. Koshovy, I. Oleksandrov, and members of the Vidort family.